So I never really read much nonfiction before, besides the chapters I actually bothered to read of my expensive, boring textbooks, but I can safely say I’ve caught the bug. Not addicted yet, but definitely on a kick. A non-fiction spree, if you will. Can I think of any more cliches that adequately describe my relationship to a section of my library? No? Okay, then. Moving on. If my father had spotted me reading this book, way back in January, he probably would have tried to hide it, just like he did with my Barack Obama book. 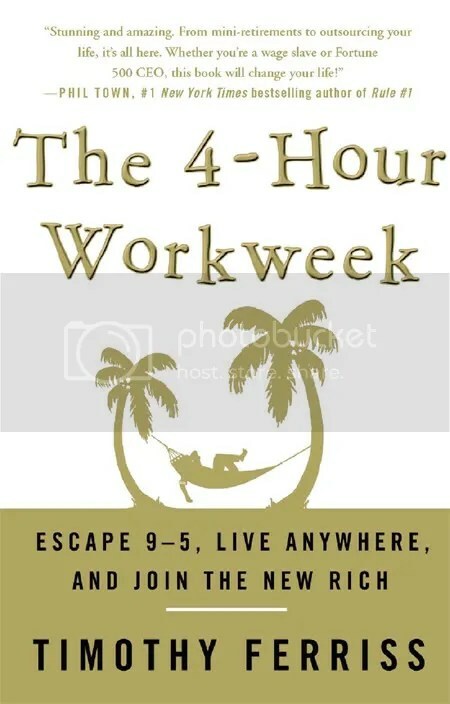 This book is the manifesto of those people who don’t actually like work, and would prefer to do something else – anything else – as much as possible while still pulling in the big bucks. I’m not going to lie and tell you this book changed my life and I’m now fully prepared to take my working-existence by the horns and weasle my way into taking months long “mini-retirements” in Rio de Janeiro to learn how to bull fight and flamenc dance. But this book is valuable for young people, like me, who have yet to build any longterm stakes in their path of employment. It’s nice to know that there are options out there; that working the 9-5 until you turn 60 (or 65, or 70 these days) isn’t the only way to make money out there. Timothy Ferriss’s book is one part memoir, where he discusses his various experiments with the principles he espouses. His bread and butter, it turns out, is an online vitamin supplement store, which he splits wide open for the reader, showing how he slowly outsourced more and more of his responsibilities and allowed the money to make itself. We also follow him on his various jaunts across the globe, taking advantage of currency rates to live on pennies (literally) in some of the more exotic and beautiful places on the globe. This book is also one part motivational, self-helpy kind of stuff. For Timothy, he wanted his time and money free to invest in his education. While flitting across the globe, he took the time to do the things that were important to him: learning new languages and new skills. For other people, this time might be better spent working on art, writing a novel, or raising a family, but the message to take your focus off your job and put on your values and interests is so important for everyone. He also includes little tidbits on how to be more comfortable taking the leap of faith to a new lifestyle, giving worksheets and mini-activities to boost your confidence. I thought they were fun. The last part of the book is the nitty-gritty of how you too can start an online business and automate it like Ferriss did. This part could be useful for some people, but it just made my head spin. As a whole, though, this book is an eye-opener, and even if business is your last goal, you can still learn different ways to free up your time for the more important things in life. Buy this for: new college grads, family or friends who have been the victim of the latest wave of layoffs, or your cousin who keeps talking about moving to Fiji for a year but hasn’t actually figured out how to go yet. How to talk about this book without talking too much about religion… hmmmm…. Well. That’s impossible. I should probably just dive in. 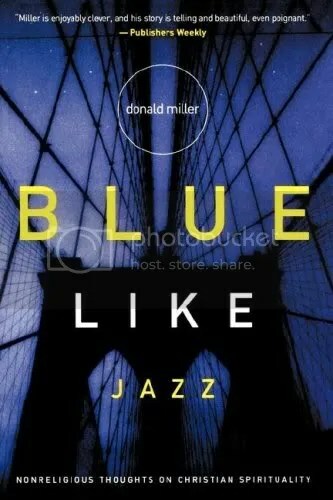 Blue Like Jazz is a book that I feel like I am the last one of my friends to read. Granted, a great deal of my friends are a little more churchy than I, and probably more spiritually in tune, but after seeing this title standing alone on everybody and their brothers “Favorite Books” section on Facebook, I decided to give it a go. This book is probably more memoir than nonfic, but we’re going strictly by call number here. Donald Miller’s life wasn’t different from any typical suburban youth. He grew up feeling a lot of guilt, as many of us do, for the great gifts he received without any provocation, and for the deliberate wrongs he did people without punishment. This guilt turned him to embrace his Christianity, and this book is mostly his journey to find both his place in the world and how his faith helped him to get there. His life brings him to Portland, Oregon, which is one of my most liberal cities in the country, and specifically, to Reed College, an institution known for both an innovative curriculum and a tolerance for drug-use among students. When the religious Miller arrives on campus, it seems that God has left the building, but he struggles to find a church with which he identifys, to meet students of his own mindset, and to be clever about spreading The Good News around campus. Similarly, Grace, Eventually is yet another highly personal count of one person’s spiritual journey through essays and vignettes. The books tackle a similar goal, but they couldn’t really be more different. Donald Miller is an earnest young man who nurses infatuations with Emily Dickinson and can’t decide if he’s ready to find a wife. He has been religious since his youth and struggles to keep the faith, so to speak. 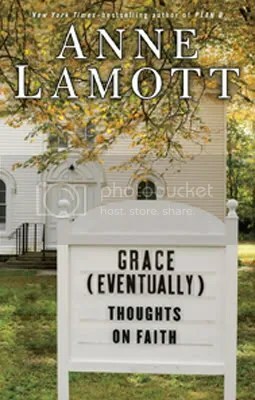 Anne Lamott is a middle-aged single mother of a teenaged son who struggles with her church activities, with hating a President who has been elected to lead her country, with inane laws that mandate her dog be leashed from the wildnerness of her home in the San Francsico area. She grew up in an atheist home, but found Christianity late in life, after years of alcoholism and other such pitfalls. Their journeys are different, yes, but the tender tone their essays take are similar. They aren’t writing to preach about one faith or another, but just to talk about God, about church, about faith and grace and prayer and growing into your religion, no matter what age you are. I enjoyed them both about equally, and I recommend them to the most tenuous or steadfast of believers. Buy these for: your college kid who you really wish would just go back to church already, for your mother or father, or anyone who you think could just use a little peace of mind. Dorky fact #345 about Jessica: she’s a pretty big Supreme Court lover. It’s my favorite governmental institution. I mean, what’s not to love? Supreme Court Justices get to shift policy, almost single-handedly, they wear sweet robes, they have lifetime job security… it’s a pretty sweet gig. Anyway, so pardon me while I dork out and tell you about this really cool book that dips as far into the very privacy-oriented court as is probably humanly possible. 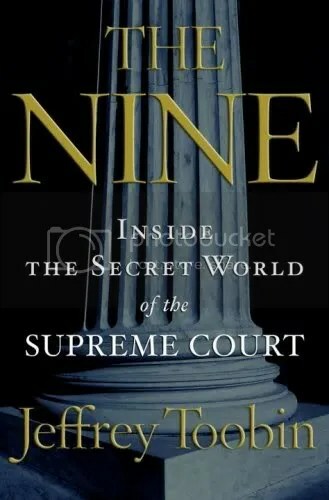 In particular, this book takes on the various undertakings of the Rehnquist court, The Nine to which he refers, and delves into both their personal histories and their political and career successes and failures. This book hits on most of the major Supreme Court decisions of my lifetime – the Clinton Impeachment, Bush vs. Gore, Terry Schiavo, the University of Michigan affirmative action cases – and not only discusses the political climate of the world at the time and of the Presidents who named each of the nine Justices, but the delicate balance of personalities and how extremely personal the act of decision making becomes. While the Court is much more guarded and individual an undertaking than say, the Presidency, there are still a lot of personality games at play. In particular, Sandra Day O’Connor takes on the role as a protagonist throughout much of the book because, for much of the Rehnquist court’s history, there were four strict, conservative and Judicial Originalists on one side of her and four more liberal or moderate judges. She literally, held the court in her own hands for many years, and the ways in which each Justice had to lobby and argue for their position is similar to what goes on in most administrative meetings all around the globe. And that is ulitmately the message of this book, I thought: that even though the Supreme Court is supposed to be this bastion of justice, unbiased in its interpretation and beholden to no man, there is an importance mainly in who nominates these Justices, and more particularly, what their opinons and interests are. Even though Sandra Day O’Connor often disappointed the party of her Presidential apointer – Ronald Reagan – she still held onto her job longer than she should have, with her husband falling quickly into the throes of Alzheimers, just so her position could be filled by another Republican president. My Conservative Father found this book to be politically biased. I tend to disagree. But then again, what don’t I tend to disagree when it comes to that man? Buy this for: your favorite political arguing buddy, be it your Dad, your girlfriend, or your great-grandma. Is it possible for a book to be both depressing and uplifting? Why yes, yes it is. David Shields uses a conglomerate of information to discuss that which we would rather not discuss: his own experience as an aging man, and that of his father, who seemed not to age at all until he turned 90, discusses famous texts on dying, and even dips into anatomy textbooks that describe exactly why it is that your hair turns gray. Yes, this book is about DEATH. But not neccesarily in a bad way. First of all, the stories that David Shields chooses to paint a picture of his life and his perception of his father are so very well written and just as well executed as any poignant, father-son memoir would be. 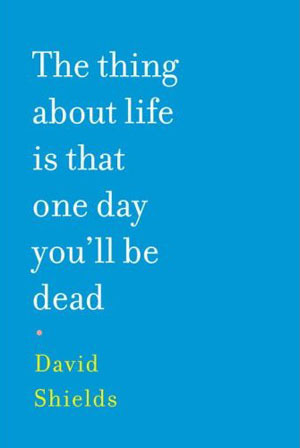 David’s father is one of those characters that you don’t think really exists – the spry old man who positively refuses to age, much to the pain of his immediate family – and how David handles this shifting perception as age finally catches up to the old man is very touching. But this book isn’t just about 95-year-olds, who seem to have a much closer relationship to death than most people. This book is also about aging – how David watches his own body disappoint him, his knees giving out when he runs, his hair falling out – and with the running anatomical commentary (the first few pages, while discussing the beginning of life, also describes some of the various ways that pregnancy and birth can end a life before it even begins), the message is that this is dying. Aging is dying. Every second of every day, we are all dying. I’ll wait for everyone to stop cursing the world, crying, or shaking your fists at God. Anyway. As I mentioned, somehow, David Shields turns this message into one of hope. There is nothing wrong with aging, because that is just what our body is doing. As humans, we have far outlived our expected lifespan, and the wrinkles, the propensity for cancer, the dementia are all just bits of your body giving up. And in the end, that’s what everyone has to do. Resign yourself and let life go on without you. Oh my God, I totally did not make this book sound like it is a pleasant reading experience at all! Please at least pick it up and read the first few pages before you listen to my completely inept and morbid opinions. This one is a good one. I promise. Buy this for: Oooh… this is a tough one. You probably don’t want to buy it for any family members over the age of 40, as they may just take offense and throw some unkind words your way in front of our family as they gather around the tree. Buy this for an English major. Or a Pre-Med. Or take a chance and give it to your not-as-old-as-they-think parents.